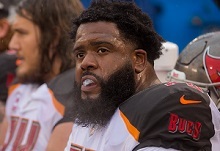 As Joe noted yesterday, Bucs free agent left tackle Donovan Smith sure didn’t sound like a guy planning to move on to a new team when the free agency dinner bell rings in less than a month. However, when the subject turned to his contract status during his appearance on “Good Morning, Football,” seen weekday mornings on NFL Network, Smith played coy. Basically, Smith hasn’t changed his message from late in the season. When Joe spoke with him in December about his contract, Smith told Joe he was leaving it up to his agent. Smith echoed that statement yesterday. Body language suggested Smith was in chill mode over it all. Smith also made it clear he enjoys playing for the Bucs. If Joe had to lay cash, Joe would bet Smith returns. He basically has the Bucs over a barrel. The Bucs need a left tackle and short of paying someone a fortune in Team Glazer loot, they likely won’t find one better than Smith. And it always helps to know each Sunday your starting left tackle will answer the bell. Smith has never missed a start in his four-year career. We won’t be the first team to overpay for an average to slightly above average LT or the last. Hopefully the new coaching can get a little more out of him. Definitely not a big fan of his. He’s average at best. But I am I’m agreeable that he can fill a hole for a season or two. I’d rather not see a 5+ yr deal for a fortune. A two year or 3 year deal would be ideal in my opinion. TDTB … I’ve always thought that Donovan Smith would make a better Guard than a LT or RT. For some reason he reminds me a lot of Carl Nicks (sad career with us, but a beast with New Orleans before that). The 2 things that made me not like him much. Taking plays off and telling people he is one of the 3 best tackles in the game. I’m guessing if he stays Bruce will let him know he isnt top 3 but he needs to be. Stop talking and be about it young man. You love Tampa. Make Tampa love you. We love hard work. According to Arians, it takes an average of 4-5 years to train a LT in the NFL. I am hoping Arians can take him to the next level. Did not have much faith in Oline coach George Warhop. Hoping the new Oline coach Joe Gilbert and run coordinator Harold Goodwin can like a fire under Smith and improve the run game. We are stuck, folks. We really didn’t draft anyone in the Oline pipeline…..and we are NOT going to find a less expensive FA to fill in. Franchise him and draft a Tackle in round 2…..
Let him go via free agency. Signs someone older, more expensive and not as good. Cut that player after one year. It’s what the bucs fans want them to do because they love change, be it good or bad. Draft the kid from Bama, or Fla, stop over paying for losers. If I was Licht I would try and get a reasonable contract extension and if Smith is trying to make bank I would franchise tag him now and try to replace Smith next season if possible Either way I think bringing him back at this time is kind of the hand we are dealt for now. The absolute most basic thing a guy making seven-figures a year should do is work hard. That should be the most fundamental element — should be! Can someone name 10 tackles that are clearly better than smith off the top of their head? And let me clarify my point as I know there are 10 left tackles better than him. People spend all day pissed about Smith’s performance and we need to let him upgrade. Well if u don’t know the name of 10 players better than him, then you evidently aren’t very educated on the position and your constant complaining is now void. We’d all like an upgrade, sure, but don’t comment unless you got a better plan. An educated one. 10 bucks says you don’t have a logical one. I also have thought Smith could be a really good LG or RT. The only really bad thing I hate about him is if a DE can get to the outside, he gets ran around all day and these young edge rushers are getting faster and stronger by the year. He has good hands and is powerful when he goes straight up against guys trying to go inside. He could move to LG and we good put Ali back in his true spot at RG. If he does stay with us at LT I’m praying Cody Ford can slip to us in the second to play RT or we get RG Chris Lindstrom (Boston College). Like the first round with DL, second round is stacked with OL and he is close to the top of the list for OG. I have a feeling he’s got more to give and a competent coach can squeeze more production out of a lot of these players. No more drafting tackles and switching them to guard and stupid experiments like that. Big veteran coaching staff is just what D Smith and this roster needed. Agreed with everything. However, I really like leidtke and I agree he could be a starter but he’s not better as it stands today and that’s a huge gamble to bank on him. I’m just saying I hope they will look at Leidtke and Wester and a lot of others on the market and draft before they give him a fat contract. Fact is at the moment we don’t have much cap space so it’s dollars vs. talent. And another fact is this guy is no where near Pro Bowl material is not worth a 4-year $40 million contract. BA seems like he is going to make some moves bringing in a lot of players in FA. Maybe not a bunch of splash moves, but good depth and rotation he’s likely worked with cus this team has sucked badly for 13 years. Bowles is going to want this entire back up defense to be wiped out (a good idea) because many were drafted by the Bucs and have been coached to play a terrible 4-3 their entire career. LB is another gaping hole that needs to be addressed. We were down to about third or fourth string all last year except for LVD. If the deal was right I would have no problem trading down a few spots for Devin White. Outside CB is a gaping hole and no one please tell me VH3 can do it if you want a solid secondary. Restructure GMC and trade him after the draft if we get Williams or Oliver. Don’t let good players walk out the door. Sign him now with as much up front money as possible so you can cut/trade later if something better comes along. If you tag, he is going to start every game next year and you will be forced to pay more or be backed into a corner for next years draft. Dotson won’t last past next year… you will need to sign 2 tackles… not a position you want to be in. *Restructure GMC, trade him before the draft and get Williams and Oliver. Restructer Dot to about $1.5 million to play second string. He may be old but he was the best player on this oline two years ago. He would be great depth not having to start every game. Let Wester, Liedtke and the rookie fight it out in TC and PS for the right to start at LT.
How many times do I have to say it? 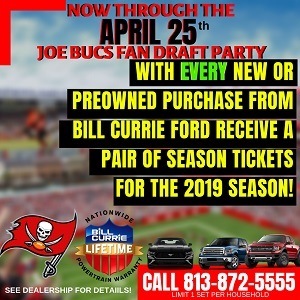 – The Bucs are very likely to get 85-90% of Donovan Smith’s capabilities/performance out of either Wester or Liedtke – for 1/10th the price of what it would cost to keep Smith. That’s easy math right there for those of you who maintain that we MUST re-sign Smith. Not to mention the Bucs will net a 3rd round compensatory pick in 2020 for letting some other team grossly overpay Smith in Free Agency…. Thing is guys they’ve already started negotiating with Donavan. I like leidke and think he could ball but it’s still a question mark. We want to win now and a rookie at lt and/or leidtke could be disasterous. Just not big enough of a sample size. If it’s me I’m transition tagging donavan. One year prove it battling leidtke. Trying my best to trade GMC and djax. Let them go if no good deals. Then I’m drafting hopefully Allen q Williams bosa or white at #5. If none there trading down. Then with the first drafting Oliver, Jonah, polite, or ferrell. With the rest of the picks I’m taking guard, tackle qb de and safety. Kicker late. I’m also going after Mathieu, ajayi, de and the best possible cb in free agency. I know it probably won’t happen because of fear that Wester, Liedtke or a rookie couldn’t handle the responsibility. That it could be “disasterous” as you said Buccernutter. I say that’s fearful thinking and has no place in an organization that should now be acting and operating “boldly”. Wester has been here 3 full years now – and held his own every time he’s been given the chance to play. Liedtke has been here since Nov 2016 – and looked very good at LT when he got his chance to play in preseason last year. Smith is supposed to be progressing with all this experience he’s gotten the last 4 years – and he’s visibly REGRESSING! And this type of performance and effort should be “rewarded” with a $12 or $13M per year contract – or even worse $15M for a franchise tag?? Bucs need to move on – let some other team grossly over pay Smith – net a decent comp pick out of that sound and bold decision – and get about the business of finding/drafting his replacement – who will likely be paid a fraction of the cost of what it would be to keep Smith. And who might even play better and more consistently than Smith in less time than it takes Smith to “come around”…. I don’t disagree with any of that but I just don’t think trusting those guys is something this staff is willing to do. That’s a huge question mark and I’m just saying its much different to have to start 16 games and if they aren’t as good as we think it could be disasterous for the offense. Pff said he improved every year for what it’s worth. We’re gonna probably overpay but I’m not too upset. We don’t need more holes and I’m not as down on donavan as most are. “Let Wester, Liedtke and the rookie fight it out in TC and PS for the right to start at LT.
Boom! My philosophy about giving this chump fat cash since the beginning. Leidtke has been in the league since 2015. Wester since 2016. They might not have started all of them but they know what a 16 game season is like in the NFL (i.e. practice, workout). And you have to take risks all the time. Leidtke was a bad OG throughout his career but when he changed to OT and had an amazing TC and PS, he’d obviously been playing the wrong spot. It could be disastourus if he didn’t start him. And I mentioned before, money vs. talent. Really needs to start taking the NASTY PILLS that Ryan Jensen takes. Totally agree with Altered , has to play to the edho of the whistle at least. Especially on encroachment where JW gets a free play to sling it. JW should not have to worry about getting blind sided when he has a free play. Not in favor of keeping Smith , not a franchise LT , but a journeyman unless he drastically improves, both phsically and mentally. Look elsewhere.